RGCD: Rocket Smash EX Available (Again) on Cartridge! I know, right? You don't hear a peep from RGCD for months, and now three news posts in a row!? Well, the truth is that just because we've been silent doesn't mean we've been idle - I really needed to get YOOMP! 64 released before announcing anything new. 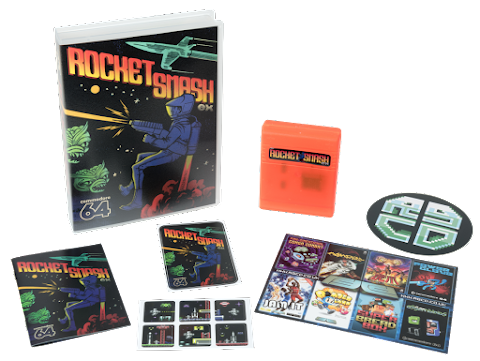 But here we are, this time with the announcement that the long-out-of-stock ROCKET SMASH EX is finally available to buy again on cartridge! Check out our press kit HERE for a load of information about the game. Download the game HERE (itch.io) for FREE/pay-what-you-want (complete with VICE for Windows, macos and linux). Buy the game on disk or tape HERE (Psytronik Software). Buy the cartridge HERE (RGCD). So what are you waiting for? If you missed out on the game last time round, grab your copy now! (Oh, and if you didn't miss around, note that the manual and gel label are available as an upgrade pack, with free postage when combined with another purchase).